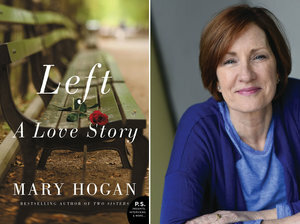 Beth Paris, Gerontologist and Director of Darien Senior Programs, will speak in conversation with Mary Hogan, author of Left: A Love Story. In this beautifully crafted novel from this bestselling author comes the story of a woman who retreats into a fantasy world on New York City’s Upper West Side as she slowly loses her once whip-smart husband to dementia. The Darien Library is proud to cosponsor this event with At Home in Darien and Darien Senior Programs. Books will be available for purchase courtesy of Barrett Bookstore. Refreshments will be served. Beth Paris has worked for the Town of Darien since 2009 first as Coordinator of Darien Senior Activities Center then as Department Head and Director of Darien Senior Programs at the Mather Center. She has been working in the field of aging for over 35 years, specializing in dementia and community-based services. She serves as a Caregiver Support Group Leader and a presenter of the Caregiver Training Course for the Southwest Connecticut Alzheimer’s Association in Fairfield County. She earned a B.S. in Gerontology and Mental Health from the University of Bridgeport. Visit Darien Library online here for additional information.